In recent years due to the rise of mobile internet, it has led the popularization of UI design. Nowadays big internet companies are increasingly focused on interaction design and user experience, and several internet behemoths have established UI design departments one after another. As people expect more on user experience of internet products, UI has increasingly become the core concern of products. UI design will certainly become more and more popular, and UI designers will certainly have a bright future. 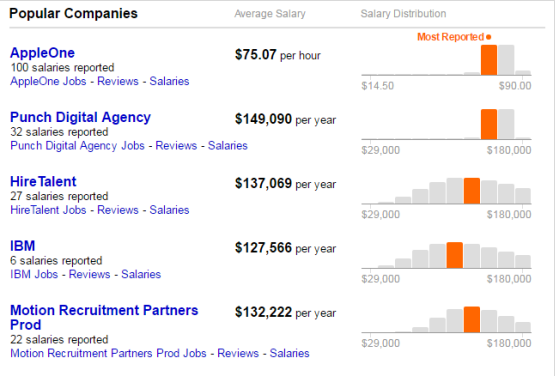 This article makes a detailed analysis of the report of UI designer salary research in United states. 1. 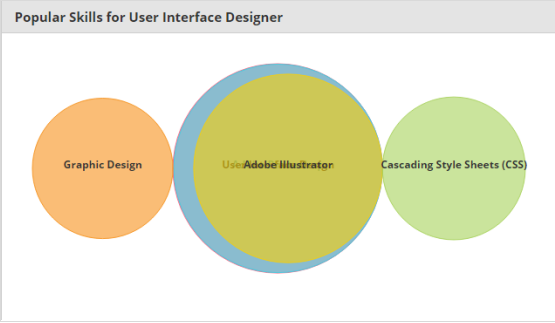 How much does an user interface designer in the United States make? The average user interface designer salary in the United States is approximately $89,106. This UI designer salary research obtains its information from 10,591 data points collected directly from employees, users, designers fromtop design communities, and job advertisements on Indeed in the past 12 months. 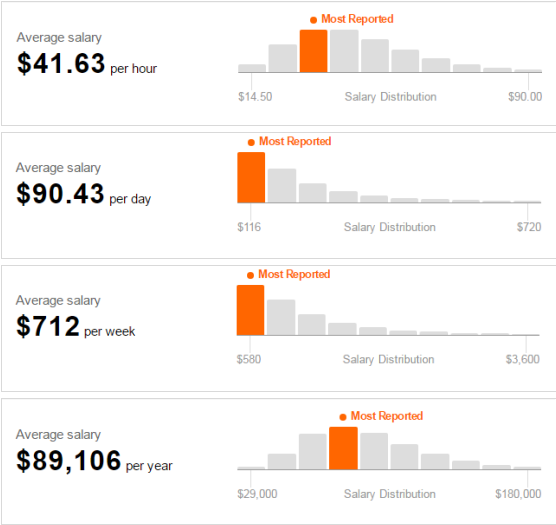 Average UI designer salary in the US is: $41.63 per hour, $90.43 per day, $712 per week, $89,106 per year. 2. This UI designer salary research surveyed several famous companies in the US. The picture blow shows the average annual UI designer wages in american famous companies. AppleOne and Strategic Staffing Solutions pay their employees by the hour; respective average salaries of the two company are $75.07 per hour, $64.67 per hour. Other companies pay their employees by the year; Punch Digital Agency gives a salary of $149,090, the highest level among them. 3.According to this UI designer salary research, the salary of designers with 0-5 years' work experience is around $61K, but survey participants with five to 10 years of experience earn a significantly higher average of $73K. 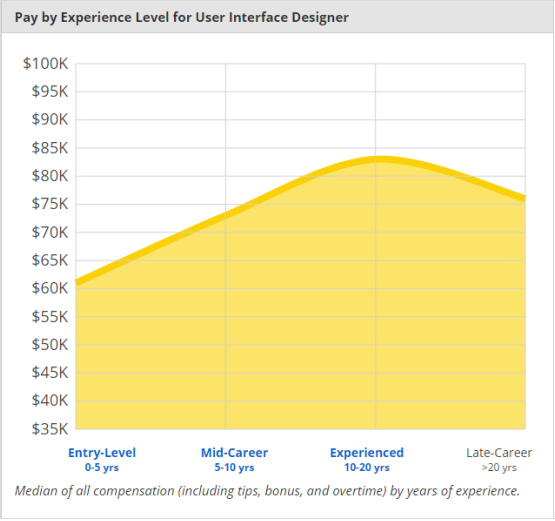 After working for 10 to 20 years, user interface designers make an average salary of $83K. User interface designers who have racked up more than two decades of experience gain lower incomes overall; the average sum for this crowd comes out to only $76K. 4. 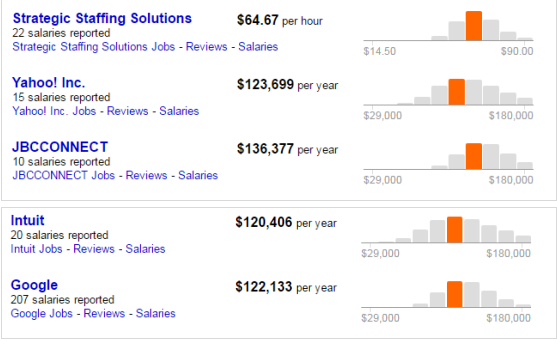 The picture below shows UI designer salary in different regions of America. Surpassing the national average by 25 percent, User Interface Designers in San Jose receive some of the highest pay in the country. User interface designers can also look forward to large paychecks in cities like Seattle (+22 percent), San Francisco (+20 percent), Boston (+12 percent), and Austin (+11 percent). 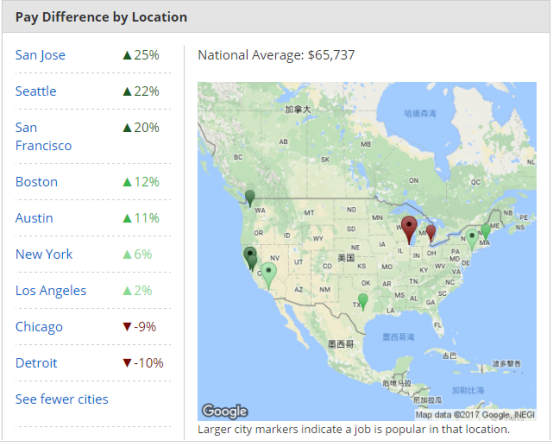 User interface designers earn a smaller-than-average sum in the Midwest: In particular, Kansas City, Detroit, and Chicago have pay rates lower than anywhere else in the country, all facing salaries below the national average. Not at the bottom but still paying below the median are employers in Detroit and Chicago (10 percent lower and 9 percent lower, respectively). 5. To gain a higher UI designer salary, designers should master some skills to be an excellent UI designer. This chart shows the most popular skills for this job and what effect each skill has on pay. Most notably, skills in Adobe Photoshop, Interaction Design, Cascading Style Sheets, and User Research are correlated to pay that is above average. At the other end of the pay range are skills like Web Development, Adobe InDesign, and Graphic Design. Most people skilled in Adobe Illustrator are similarly competent in User Interface Design. 6. Different types of designers have different salary levels. 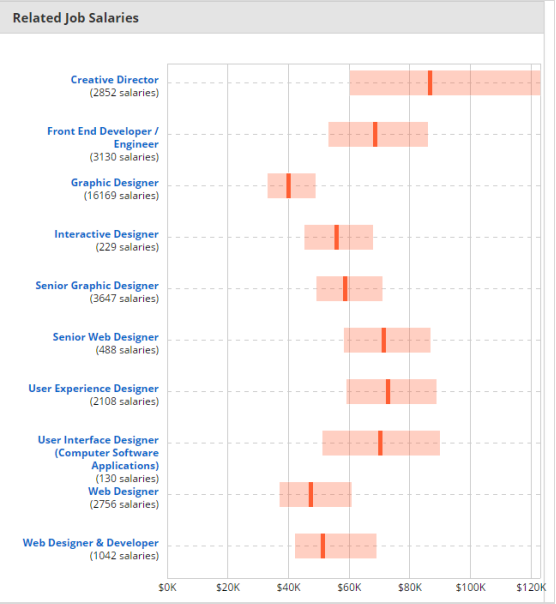 The survey compares UI designer salary level with other categories of designers. Creative designers have the highest level and the highest fluctuation, a range from 60,000 to 120,000 US dollars; it is followed by the front-end developers, senior web designers, user experience designers and user interface designers, the level range of which is around $ 50,000 to $ 90,000; then interactive designers, senior art designers, web designers, about 40,000 to 7 Million; art designers are at the lowest level, but have the smallest range of fluctuation. Beginners' Guide: What is An UX Designer?